Here’s the ironic thing about this recipe for spicy fried noodles: I am the least spicy person I know. I am the one who buys the mild salsa at the supermarket. I am the one who is slightly afraid of the bottle of Sriracha sauce in my fridge. I am the one who buys one lonely jalapeño for a recipe, and then uses about 1/8 of it. So why on earth I was motivated to make spicy fried noodles, and why on earth I ate every last speck on my plate is anyone’s guess…but I did and I did, and I’m going to make them AGAIN. Which just goes to show you that anything can happen! It might have something to do with the fact that they have tons of baby spinach in them, which is my vegetable crush. Or that they are topped with chopped peanuts. Or that they have a scrumptious sauce that is a combo of soy sauce and fresh ginger and lime juice and other fabulous things. Or that I added the Sriracha sauce in two batches – one teeny drop of it for me, and one generous squirt of it for the spicy Southern husband. It goes in at the end of the cooking process, so this recipe is customizably spicy. Whatever the reason, I have crossed over to the the spicy side. Okay, the MILDLY spicy side. 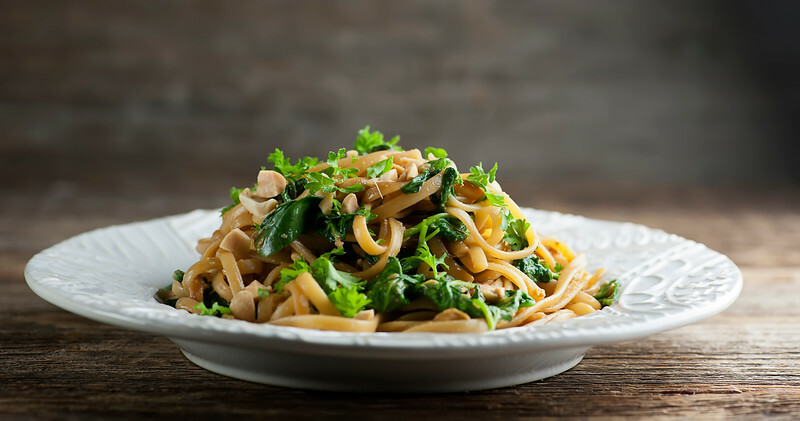 But however spicy or tame you like things, give these noodles a whirl – they are magically delicious! 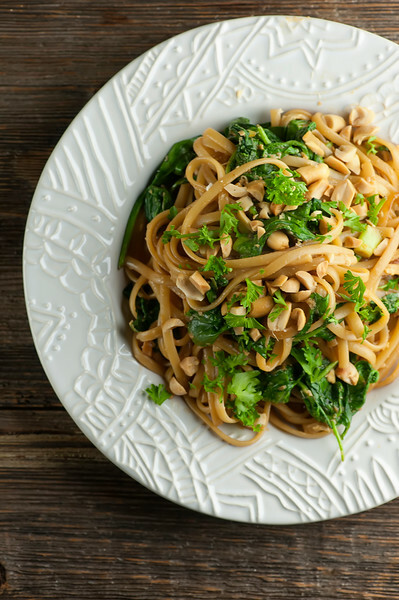 These spicy fried noodles are chock-full of veggies and nuts and, yes, spice! Mix scallions, soy sauce, ginger, wine, sesame oil together in a small bowl. Cook linguine according to package directions until done. Drain and place in mixing bowl and toss with 1 tablespoon of the canola oil. Add the remaining canola oil to a large deep skillet and heat over medium high. Add the scallion mixture and bring to a simmer. Season to taste with Sriracha sauce (you can do this in a couple of batches if you have people who have different opinions on spiciness). Divide among plates, garnish with peanuts and parsley and serve! LOVE spicy food. Can not wait to give this a try! Looks delicious. If there’s one thing I love, it’s SPICE! Especially in my noodles! I know you are a spice-loving girl – I’m trying to be more like YOU! These look awesome Kate! I know we would love these!